Macrobiotic Diet: this diet is focused on the consumption of foods that contain high amounts of fiber and low fats. A Macrobiotic Diet includes foods such as whole grains, fruits, vegetables, beans, soups and soy products. There has been some evidence that this diet is helpful to those who are suffering from cancer and various diseases, although this has not yet been proven. Glycemic Index Diet: is considered as one of the easiest diet programs for women to successfully lose weight with. It is especially beneficial to pregnant women and to diabetes patients. The GI diet focuses on foods that are low in fat, moderate carbohydrates, high protein and high fiber. It also includes a considerable amount of vitamins and minerals. Your food choices include cherries, porridge, celery, red kidney beans, barley, fat free milk, high fiber whole grain, nuts, pasta, organic fruits, skinless chicken, vegetables that are low in starch and foods that contain high amount of omega-3 fatty acids such as fish. The GI diet can help the dieter prolong her workout activities and maintain a normal level of carbohydrates even after intensive exercise. It can also help reduce food cravings and maintain a normal cholesterol level. South Beach Diet: this diet promotes the consumption of high proteins, healthy carbohydrates, and unsaturated fats. During the first phase of the diet, you are prohibited from consuming foods that contain high amounts of sugar, high GI vegetables, bread, rice, processed carbohydrates, and fruits. However, you may consume eggs, lean meat, and fish. On the second phase, you are allowed to include fruits and vegetables as well as whole grains into your diet. The third phase is maintainence and at this point you would be adding soy products, beans, fruits, and vegetables to what you’ve already been eating in Phase 1 and Phase 2. Mediterranean Diet: this is a very simple diet program that involves eating fruits, vegetables, small amount of chicken or fish, cereals, whole grains, yogurt, cheese, wine and olive oil. The focus of the program is to keep the consumption of saturated fats low and the consumption of dietary fibers and monosaturated fats high. These are just some of the most popular diet plans most dieters opt for. However, before starting on any of these, make sure to consult your physician or a dietitian first to determine which of these is suitable for you and for your present health condition. Try not to fry, instead brush or spray a cookie sheet with oil and “oven fry”. It’s important to use a flat sheet or cookie sheet rather than a pan with high sides, otherwise your food will bake, not “fry”. Even better, place a cooling rack inside a roasting pan. Spray rack with oil and place your food on the rack before baking. For a thicker coating dip food in nondairy milk, veggie broth, or any other liquid (even water) before dredging. These substitutions don’t work well for cookies, but are great for cookie bars, cakes and other baked goods. Since I don’t eat eggs very often I keep a couple cartons of frozen egg white in the freezer to use when baking. Two egg whites for one whole egg. Replace white flour with sifted whole grain flour for a Starch Meal, using 1/4 less than the recipe calls for. Replace sugar with Stevia , Splenda, Truvia, honey, agave nectar, pure maple syrup, pr any other unrefined sugar. You’ll have to experiment with the amount that will satisfy you and work with your recipe. Substitute cocoa powder and unsweetened or bittersweet (bittersweet does have some sugar though) chocolate wherever you can. Adjust the sweetener to compensate for the loss of sugar that would have been in the semi-sweet or milk chocolate. For a pastry crust use a whole wheat pastry crust. If you’ve got the time you could make whole wheat tortillas, adding in some ground nuts, flavoring extract and acceptable sweetener and use those in place of a pastry crust. Another idea would be to use a crumb crust, using store bought or home made natural cookies, instead of a pastry crust. For a pastry crust use a whole wheat pastry crust. If you don’t have a recipe for one I’ll be publishing one on the Starch Recipes page sometime in the near future. For a crumb crust make sure that the crumb mixture consists of whole grains or ground nuts. Use the chart below to choose a potato that’s lower in starch. Keep in mind though that a potato’s starch content determines the best way to use it. The rule of thumb: the more starch a potato has, the less moisture it contains, which results in a fluffier texture when cooked. Note: new potatoes (which are often red potatoes) can be any type of potato that’s been picked before it matures. They have the same starch content of the mature potato. I buy mostly low starch potatoes and use them in place of the more traditional Russet or Baking potatoes. They cost a little more, but what would you pay to lose a pound? cauliflower is the most direct substitute for potatoes and one you can always count on. Pureed: Use cauliflower instead of potatoes. Whole wheat lavosh. These are fat free and taste great. Many supermarkets carry them, and almost every health food store I’ve shopped at. Very cheap, very big, excellent for wraps. I use these in place of tortillas all the time. You won’t miss the fat in this recipe, and they’re so easy to make. A really fun family project. You mix up the dough, and divide it. Then let one family member roll out the tortillas, another cook them, another fill them, another roll them, another stack them in a baking pan to keep in a warm oven. Because making tortillas will coats my kitchen with a flour residue I always make as many as I can at a time and freeze or refrigerate the leftovers. optional: herbs fresh herbs are best, but if you don’t have them use dried, just in lesser quantities: basil, oregano, cilantro, rosemary, sage, minced garlic, minced dried tomatoes, cumin, coriander, fennel, cinnamon, finely minced citrus zest … You might also want to try mixing a little flavoring extract into the water especially if you’re making a dessert tortilla. Vanilla, rum, coconut, chocolate, or orange extracts go great with cinnamon and/or citrus zest. I haven’t yet tried using flavoring for non-dessert tortillas but I’d like to try tequila, vodka, maybe even wine. Don’t worry about the alcohol, it burns off when you cook the tortillas. If you try it, please e-mail me with details of your experience. Mix the flour with enough water to form a stiff, but workable dough. Cover dough and let rest for at least 30 minutes or refrigerate and proceed the next day. Cut dough into equal sized pieces, depending on how large you want your tortillas. On a floured work surface with a floured rolling pin, roll each dough ball into a thin tortilla. Heat griddle or heavy pan. Place first tortilla in pan and let it cook while you roll out the next tortilla. When the tortilla bubbles on the top and has small brown dots on the underside, turn it over. It will cook very quickly on the second side. Continue cooking and rolling until all of your dough is used. Stir 2 packages yeast into 2 cups warm (not hot) water and 1 cup low-fat or non-fat rice or nut milk. Allow 3-4 minutes for yeast to dissolve, then add 1 tablespoon salt, 1/4 cup date or maple sugar and 4 1/2 cups whole wheat flour, and any of the optional ingredients below. Knead for 2 minutes, adding a bit more flour to keep the dough from being too sticky. If using a food processor mix ingredients in processor, knead for 10 seconds. Let rest for 10 minutes. Add another cup of flour, kneading the dough for 10 minutes, adding more flour if necessary to keep dough from being too sticky. Using food processor mix for 30 seconds to 1 minute, until dough is elastic. At this point you can either continue to make the bread or freeze all or half of it. If you’re using frozen dough, let it thaw in the refrigerator for 8 hours or overnight, then proceed. Oil the bowl, place a towel or plate over it and set to rise in a warm place for 2 hours. Or you can set the oven to warm, turn off, and place dough bowl in oven, uncovered. Punch down the dough. You now may add anything from the list below. Divide the dough in half and place in nonstick or lightly oiled loaf pan. Cover with towel or oiled saran wrap and let rise 1 hour. Bake in preheated 350 degree oven for 50-60 minutes until browned and sounds slightly hollow when you thump the bottom of the loaf. Let it cool on a rack or towel before slicing. I prefer to bake all my breads in shaped bread tins (order tins). They come in several different shapes and while that’s fun, it’s really the texture of the loaf that I’m after. Because these pans have a cap on both ends, the bread turns out very compact and can be thinly sliced, which makes for wonderful sandwiches and “holders” for bruschetta and other spreads. If you have kids you may find you have more luck getting them to eat whole wheat bread if you serve it to them in these fun shapes. As an alternative (to the kids turning up their noses dilemma) you can make their sandwiches and then use cookie cutters to cut them into shapes. Depending on the sandwich filling I save the discards in a plastic bag in the freezer and use them later to make bread pudding or strada. When using shaped bread tins don’t allow the bread to rise beyond what it normally would while defrosting. If using bread dough straight from the bowl, let it rise 30 to 60 minutes, punch down, shape into a thick snake and slip into lightly greased bread tins. Sometimes it’s handy to have a substitute for whole grain pasta, such as when you are wanting to get more veggies into your diet. This is actually a “Neutral” recipe, suitable for either a Starch or Protein sauce. tofu: freeze a block of firm tofu, then cut into noodle size strips. Heat through or saute to brown. Don’t risk scraping your knuckles by worrying about getting the very last bit of each vegetable. I save the “bits” and use them in other dishes, eat them right then, or freeze them and use to make a vegetable broth. If you’ve used the slicer section of the grater to make your veggie strips you’ll need to stack the slices and cut them into 1/4 – 1/2 inch wide strips. Lightly steam or dry saute the veggie strips until “al dente”. Top with butter and a sprinkling of soy Parmesan cheese, shredded soy or nut cheese, or any of your favorite pasta sauces. Puree in blender 1/2 a package soft tofu, juice from 1/2 a small lemon or lime, sea salt & pepper to taste. When tofu is smooth, you may have to stop and scrape down the sides once or twice, with the blender still running drizzle in 1/4-1/2 cup extra-virgin olive oil until mayo is desired thickness. Also taste the mayo – if it tastes a bit floury add more oil. If you don’t like the strong taste of extra-virgin olive oil you could use canola oil or nut or seed oil instead. Be aware that olive oil and canola oil are the most hearth healthy, but an occasional foray into nut and seed oil won’t be harmful and you may relish the change every now and then. Can be fried in any type of oil, but olive or canola oil is the best. The following (except for the soy flour) can also be used to substitute for bread crumbs. If your recipe calls for a rice crust substitute textured protein granules, soy granules or finely chopped nuts. You may need to add extra moisture to hold the crust together. You can add water, softened or melted butter, broth, or just omit the crust. For recipes calling for a pastry crust substitute crepes or melt butter in an omelette pan, thinly coat bottom of pan with egg and cook until done; or butter pan and dust with finely grated parmesan cheese or just skip the crust. For a crumb crust substitute ground nuts or sesame seeds mixed with a little soy flour. For a pastry crust substitute soy flour pastry in your favorite crust recipe or use a crumb crust. Frozen egg substitute or egg whites. Make sure that you buy the kind which has no additives. Substitute two egg whites for one whole egg in baked goods, except cookies. Use one whole egg and two to three egg whites and you won’t notice any difference in the taste. Two egg whites for one whole egg in baked goods, except for cookies. Replace oil with the same amount of pureed Fruit. Pumpkin, and applesauce are the best because they are low in carbs, next on the carb count meter are dates and prunes and bananas are way too high in carbs to use when on a high protein diet. Replace white flour with soy flour. Replace sugar with Splenda, Truvia, Sweet n Low or Stevia if you’re trying to lose weight, Equal or other aspartame sweetener if you’re on maintenance. Experiment with the amount of sweetener that will work with your recipe. If you’re making a Fruit dessert add 1/2 teaspoon – 1 tablespoon baking soda before adding the sugar substitute. The baking soda counters the tartness of the Fruit, allowing you to add less sweetener. Don’t use sucrose, molasses, raw sugar or cane sugar. All of these will sabotage your carb count. This bread is so easy to make I often make a double batch and spread the extra batter onto an oiled jelly roll pan or pizza pan. Bake the bread for 15 minutes and you’ve got a pizza crust. Yea, bet you thought you’d never eat pizza again! Mix all ingredients well and pour into well greased loaf pan. Bake in preheated 275 degree oven for one hour. Test with toothpick inserted into middle of loaf. You should see moist crumbs clinging to your tester but not wet crumbs. If the outside of your loaf is getting too brown cover the top with aluminum foil or if the sides and bottom are getting too brown. Take the loaf out of the oven. Let cool completely, carefully slice and spread slices out on an oiled baking sheet. Bake at 350 degrees until bread is done. Use nondairy cheese, cream cheese, and sour cream in place of regular cheese. Some substitutes are perfectly acceptable, others are somewhat acceptable (indicated by italicized type) and therefore should be used only occasionally or if you just must have that particular item (i.e. comfort food, family or peer pressure, having a party …). If there is no entry under a certain column that means that there is no substitute needed for that food group. If an entry spans two or more columns then it works for those two or three food groups. This page is a full list of all the UnDiet substitutes. If you’re focusing on a Protein Blast or meat free diet you can print out either the Protein Substitutes or Starch Substitutes pages. Soy products that contain Starches such as grain syrup or food starch are in a small enough amount that if you’re on a vegetarian diet you can safely use them in place of meat in Protein dishes. = 1 egg Three egg yolks = one whole egg. for. It really does work! so 1 cup of all purpose flour becomes 1/2 cup soy flour. date/maple sugar instead of white sugar or sugar sub. substitutes. Pastry crust: soy flour pastry crust. Crumb Crust: sugar free whole grain cookies or graham crackers Crumb crust: ground nuts with a little soy flour. can add water, softened or melted butter, broth. crumb crust: whole grains, ground nuts or seeds .
. Same as cottage cheese. healthy. Make sure that you buy one with no additives. Two egg whites for one whole egg, except in cookies. sub for milk or half & half or use soymilk. : Soak dried tomatoes in medium hot water for an hour – overnight. Puree using only enough of the soaking liquid to make a thick puree. Tomato Sauce: add more liquid. taking care not to let it boil. roasted red bell peppers instead as they can be cooked. onion, celery, bell pepper .. . .
be cooked!) .. . .
long to dry I make 2 full trays & freeze the excess. yellow or orange bell pepper, fennel, cauliflower .. . .
Want to Improve Your Health? Learn How to Cook! Just about everything in life is a trade off. If you want the convenience of fast food you are going to be consuming a lot of unhealthy junk. Most convenience food is highly processed and loaded with preservatives that are not good for you. The truth is that over time, these harmful toxins can build up in your body tissue. Because of this, if you are serious about being healthy long term, one of the best things that you can learn how to do is cook. Cooking at home will not only help you to improve your health, it will also help improve your financial situation. It is amazing how much cooking at home can save you. While there is no need to become a gourmet, you do need to focus on making healthy foods. Cooking the same unhealthy food at home is not going to be of benefit. You will want to stick to lean proteins, fruits, vegetables and whole grains. A good rule of thumb is that other than grains, try to shop on the perimeter of the grocery store and stay away from foods in boxes. Unless processed foods are USDA certified, they are generally overly processed and loaded with preservatives. What you want is whole clean foods. A good way to stay motivated is to try foods that you have never had before. For instance, if you love pasta but know that white carbohydrates are not good for you, you may want to learn how to cook quinoa. There are many snack items that do not require any preparation at home such as fruits and Greek yogurt, but learning to prepare a few special items can be fun. I like to try new hummus recipes because the high protein and fiber content really helps keep me full. Experiment and learn what works for you. The food we eat everyday contains a certain amount of calories. These calories give our body the energy needed to do our everyday activities. If we take fewer calories then our body will tend to use up the stored fats to meet the energy requirements. The basic concept of a low calorie diet is to reduce the amount of calories taken in order to burn the fats. This is the reason why most people who want to lose weight go on a low calorie diet hoping to achieve fast weight loss. Right before you go into a low calorie diet, it is highly advised that you should consult a physician in order to determine whether your body is suitable for a low calorie diet regimen. This type of diet is mainly for people who are overweight or obese with a Body Mass Index (BMI) of more than 30. This is not recommended for children and pregnant women because it could reduce their weight drastically and can lead to constipation, diarrhea and dizziness. If your weight loss is not carefully monitored, it could lead to liver problems. a. Before you go on a low calorie diet try to enhance your knowledge on the amount of calorie that different food and food products contain. b. Have a journal and take note of the amount of calories you are taking each day. This will help you evaluate your progress from time to time. d. Have a list of foods that have low calories and select among this list the foods that you love to eat. It is advisable that you should include grains, fruits and vegetables on your diet regimen. e. Even though it is very tempting, don’t ever go for a very low calorie diet. It is advised not to go below a 1500 calorie diet. Don’t starve yourself! f. Don’t avoid carbohydrates. Your body needs carbohydrates because it is rich in fibers that will help your digestion as you go on with your diet regimen and at the same time it helps in preventing digestive problems. g. Undergoing a low calorie diet doesn’t mean that you can’t eat the food you like. The key here is taking them in moderation. By following the tips above, your will be able to have an effective weight loss with the help of a low calorie diet. If ever some problems may arise, consult your physician right away. Break off and discard woody ends of asparagus. Slice asparagus into 1/4″thick rounds. Season with sea salt and black pepper and saute in a little olive oil over medium high heat until al dente. Add tomatoes and a pinch of seal salt and a dash of black pepper. Continue saueting until the tomatoes release their juices. While sauce is cooking prepare the pasta according to package directions. When sauce is finished add pasta and toss until well combined. Serve immediately. This is a makeover of the old classic “Cheeseburger Pie”. In this version ground turkey replaces the ground beef and we’re 86ing the crust altogether. Trust me, you won’t miss it. Brown turkey, onion & garlic in a large pan over medium high heat until turkey is browned. Stir Worcestershire sauce into turkey mixture. Pour turkey mixture into a lightly oiled pie plate. In a medium bowl, mix cottage cheese with egg. Pour cottage cheese mixture over turkey. Top with cheddar cheese. Place tomato slices on top and bake for 30-40 minutes until casserole is hot and bubbling. Weight management is so difficult for most of us. It is easy for us to gain weight, but losing it is a different story. It requires a calculated effort and some planning. There are many programs out there that promise to help you lose weight. But many of them do not help you to maintain weight loss. Let’s face it, nothing is worse than having to dig out your old “fat” clothes or have to buy ones that are even larger because you have not maintained your weight loss. The objective is to lose 10 pounds and prevent it from creeping back on. In order to do this, you must make lasting lifestyle changes. How do you do it? Starving yourself is not the answer. For while you may lose 10 pounds this way, once you resort back to your old eating habits you will gain the weight back. Often you will gain more weight than you had lost to begin with. Permanent weight loss requires some discipline and motivation. You can do it quite easily by following these 3 simple rules. Many people have had lasting weight loss success by doing nothing more than cutting these foods out of their diet. Replacing those foods that are devoid of nutrition and replacing them with healthier options such as organic leafy greens, vegetables, fruits and whole grains will make a marked difference not only to your waist but also to your health in general. Do not consider these changes deprivation. You can include foods in your diet that are nutritious and delicious. The options are endless. In the health-conscious society that we live in, healthy choices are readily available and becoming more affordable. By making a few important changes to your lifestyle and a conscious effort about what you eat, you can lose 10 pounds in no time and keep it off permanently. Help! Why is My Diet Not Working? The list below is extracted from my book “Help! 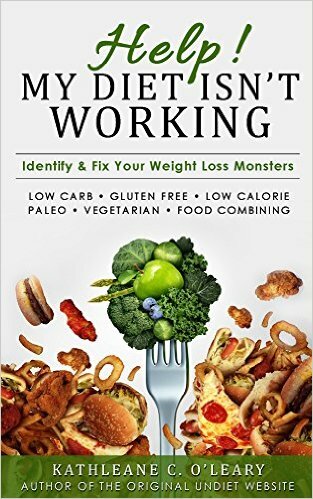 My Diet Isn’t Working: Identify & Banish Your Weight Loss Monsters”. If there are some tips that you find difficult then just start with the ones that are easier for you. If this takes care of the problem then you’re home free. If not, then begin eliminating others one by one. When you’re satisfied with your progress you can stop eliminating things or keep going to speed up your weight loss and facilitate a healthier lifestyle. You’re welcome to ask questions in the Comments about any of the items below. In the book I provide a full explanation for why a certain technique or suggestion is given. Check your diet for hidden refined sugars and ruthlessly eliminate them. Check labels for corn syrup products such as high fructose corn syrup and toss out any that contain these. Caffeinated drinks kick up your blood sugar, switch to decaf. If you’re not exercising at all, or exercising very little, you may need to add some physical activity to your routine to continue losing weight. To raise your metabolism so that you’re burning calories all day long you need to exercise at least 20-30 minutes at an intensity that has you sweating within 7-12 minutes into your workout. Once you reach your goal weight you’ll find it easier to hold at that weight if you consume no more than one 12 ounce beer or one to two 4 ounce glasses of dry wine a day. During weight loss, consuming alcohol on a daily basis can be a huge saboteur. It depresses your metabolism, stimulates your appetite and it’s loaded with high glycemic index calories. Cut back on carrots, potatoes and corn (including popcorn) until you begin to lose again or until you reach your goal weight. These foods all metabolize as sugar. Switch UnDiet plans: try switching to Produce Power for one to two weeks or make it a regular part of your lifestyle by eating Produce Power for one or two days a week. If you’re already doing Produce Power you may be consuming too few calories, so try switching to Protein Blast . If you’re on Protein Blast and have hit a plateau it often helps to switch to eating Fruit in the morning and Veggies and Starches for the rest of the day, completely eliminating Proteins for 3-5 days. When you start losing again go back to your plan of choice. Most chewing gum contains either sugar or aspartame. Eliminate it during weight loss. Re-read all labels looking for hidden refined sugars, aspartame, Nutrasweet and other items. Double check your daily intake to be sure you haven’t strayed from your calorie count, carb count, portion size or whatever measure you’re using for your weight loss. You may be deficient in at least one vitamin or mineral. You should be taking a multivitamin with minerals twice a day, essential fatty acids (especially Omega-3) twice a day, and a daily supplement of Chromium. Be sure that you’ve eliminated trans-fats (margarine and foods with partially hydrogenated oils). Some medications especially heavy duty tranquilizers, many diet pills, long term use of anti-depressants, diuretics, birth control, estrogen, and antibiotics can interfere with your metabolism, thus halting or slowing weight loss. Check with your doctor to see if any medication(s) you’re taking could be the problem and if there is something else you could take. If you’ve been UnDieting for two or more weeks you might want to ask your doctor to retest you to see if you still need the medication(s) or if you need the same dosage. A thyroid condition can slow or stop weight loss. A simple at home test for a thyroid condition is to take your temperature under your arm within ten minutes of waking up in the morning. An underarm temperature below 97.8 suggests hypothyroidism or hypometabolism. Of course whether you test negative or positive, make sure you check with your doctor. Cut back on, bread, rice, pasta and other Starches until you begin to lose again or until you reach your goal weight. If you’re on the Protein Blast make sure that you’re counting your carbohydrates correctly. Read labels, write down everything you eat in a day for several days and have a friend check your list for hidden carbohydrates. Diet sodas, diet gelatins, powdered diet drinks and many other prepackaged diet and “sugar free” foods contain aspartame or sucrose which slows or halts weight loss in many people. Substitute non-alcoholic beer which is a Starch, Arrowhead Fruit-flavored mineral waters (many other mineral waters contain sweeteners & Starches) work with all meal plans, or distilled water with a squeeze of fresh lemon or lime juice. Don’t use more than 6 tablespoons of heavy cream in your coffee in a day. This isn’t a hard and fast rule, but if you’re having trouble losing weight this could be the culprit. If nothing is working, you may be metabolically resistant. This can occur for many reasons, especially if you are severely overweight and/or have yo-yo dieted in the past. The Fat Blast can be the ticket to kicking you into a downward spiral. The Fat Blast gives you even faster results than total fasting. Isn’t that incredible – you can eat and lose weight faster than when you’re not eating at all! Note: DO NOT stay on the Fat Blast for more than five days. Even “good” sugars like Rapadura, Sucanat, raw unfiltered honey, real maple syrup, date sugar, Sweet ‘N Low … when consumed in too high a quantity can halt weight loss. Try cutting them out for a few days and see if your weight loss resumes. If you still want to use these sugars use them occasionally, not daily. If you do eat sugar try to eat it 30 minutes before or after a meal. Sugar, yes even good sugar, inhibits digestion and we all know what that means – EXTRA POUNDS! This doesn’t include sweeteners that don’t spike your insulin level such as aspartame, Sweet ‘N Low, Somersweet, and others. If you’re having trouble with indigestion try not eating acid Fruits (oranges, tomatoes, lemons, pineapples …) with Proteins. Acid Fruits can hamper Protein digestion and result in putrefaction. Milk and orange juice, while by no means an indigestible combination, is far from a good combination. Orange juice and eggs however are an even worse combination. If you’re having trouble with indigestion try not eating Starches and sugars in the same meal. This combination will produce fermentation in most people. If you’re having trouble with gas and/or upset stomach when eating Fruit try eating melons by themselves, not combining them with other Fruits and foods. This guideline is based on the ease and speed in which melons decompose in the digestive system. Milk is best taken alone or not at all. Milk is the natural food of young mammals; each species producing milk adapted to the needs of its young. The young of each species, including our own, take the milk alone, not in combination with other foods. Milk doesn’t digest in the stomach, but in the duodenum, the result being that when milk is taken the stomach does not secrete digestive enzymes. You may be using too much soy with your Starch meals. Try cutting back or eliminating it from Starch meals. If you’ve been mixing Protein with Starches in small amounts and you’re weight loss has stopped you may be using too much of one food group with the other. Cut down on how much Protein you mix with Starches and vice versa. Make sure you’re eating at least 50% raw foods each day and preferably 80% when trying to lose weight. Also make sure that at least one meal, preferably breakfast is completely live. If you’re eating too many peanut products, which are acid forming and difficult to digest this may have slowed your weight loss. Pre-digest nuts, beans, and grains by soaking in water for thirty minutes before cooking or eating them raw. Discard the soaking water. Make sure dried Fruits and vegetables are sulfur free. Some people find they lose weight easier if they eat Fruit only in the mornings and not any other time of the day unless it’s a Living Foods day. Giving yourself a Living Foods day once a week will jump start your weight loss. Better yet, treat yourself to a Living Foods day 2-3 days a week until you reach your end or mid-weight goal. Chicken Broth is too acidic for many human digestive system. If you are needing to watch your acidic food intake there are some great mock chicken broths which can be found in health food stores and most grocery stores. Check the bulk food section for powdered broth. Make sure to read the ingredients list as some have awful things like dextrose, etc. If you live in an area that has a Whole Foods Market(formerly Mrs. Gooches) they have a wonderful powdered mock chicken broth and Imagine Soups has a Creamy “Chicken” soup that is THE BEST. Keep your pantry stocked with several delicious chicken flavored broths & soups and you’ll have the makings for turning almost anything into a delicious meal. This is a living foods version of the popular cauliflower-based mashed “potato” recipe. Scroll to the end of the recipe for a version that those in your family who aren’t interested in eating raw foods will enjoy. Process 1 small head cauliflower, chopped in a food processor until it looks grainy. Place cauliflower in a pot, slow cooker, or electric skillet set to the lowest temperature possible. Stir in 1/4 c extra virgin olive oil. Season to taste with sea salt, black pepper & powdered broth. Stir until warmed. If you have a thermometer, this dish should be warmed to 105 degrees but if you don’t have a thermometer, just stir until cauliflower is hot. Remove from heat immediately. If the rest of your family isn’t into living foods you can set aside a portion for yourself and then continue cooking the cauliflower until it’s soft. If desired you can then use a potato masher or fork to make the “potatoes” creamier.